Contact information may include name, address, phone number, email address, or other online or physical contact information. Cookies or mechanisms that perform similar functions. A cookie is a small text file that a website can place on your computer's hard drive to collect information about your activities on the site or to allow the site to remember information about you and your activities. Demographic information may include social and economic categories that apply to you, such as your gender, age, income, or where you are from. Financial information may include your accounts, balances, and transactions. Health information may include data about your medical condition or your interest in health-related topics, services, or products. Contacting you through means other than telephone (for example, email or postal mail) to market services or products. 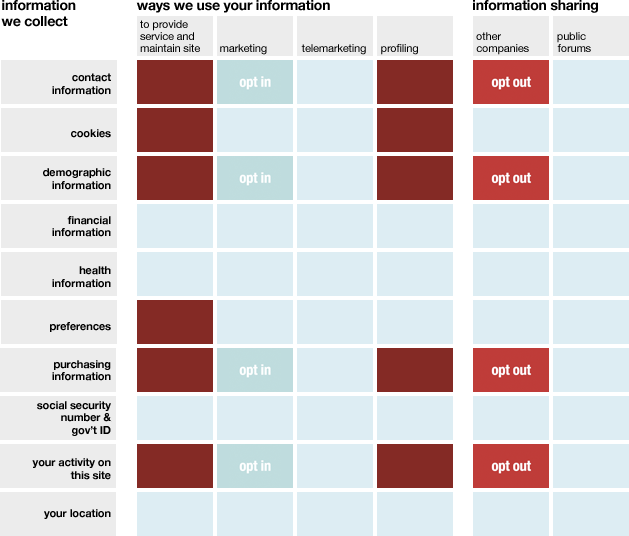 Most companies share data with business partners who only use your information to provide the services you requested. This cateogory describes sites that share with other companies that use your information beyond fulfilling your requests. Make decisions that directly affect you, such as to display ads based on your activity on the site. Information that the site collects about you may be linked to an anonymous ID code, or may be linked to your identity. Collecting information to provide the service you requested, to customize the site for your current visit, to perform web site and system maintenance, or to enhance, evaluate, or otherwise review the site, but without connecting any information to you. A public area, such as a bulletin board, chat room, or directory. Information about your purchases may include the payment methods you used. Includes government-issued identifiers such as your social security number. Contacting you by telephone to market services or products. Collect information about your exact geographic location, such as data transmitted by your GPS-enabled device.